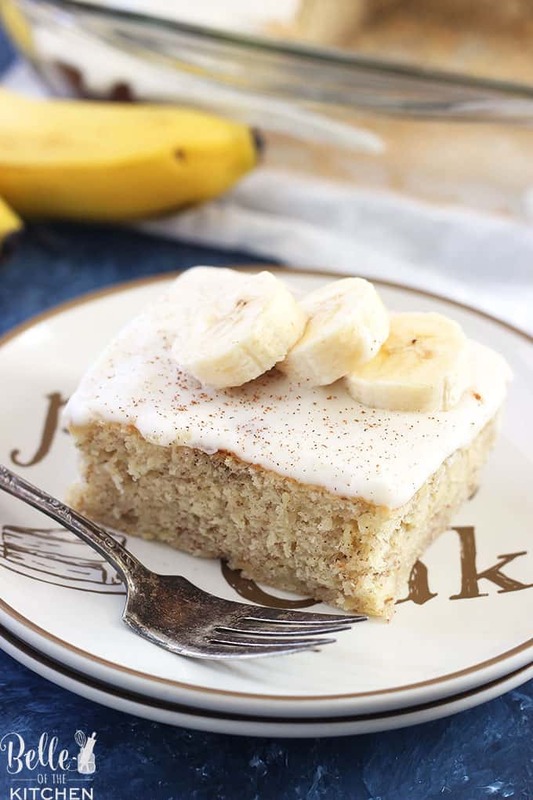 Banana Cake – put those overripe bananas on your counter to good use with this simple and delicious Banana Cake recipe! It’s topped with a delicious vanilla frosting and makes a perfect treat or snack for anytime! Today’s recipe is brought to you thanks to a huge bunch of overripe bananas I had last week. I’m normally a good banana eater as are my kiddos, but we weren’t able to eat them in time before the brown spots started to set in. We were otherwise detained because our house was hit with the dreaded stomach bug. ???? It started on Wednesday afternoon with my daughter. We thought maybe it was just her, and that she had just possibly eaten something bad, until it hit me next at 2 in the morning. Followed about 15 minutes later by my oldest! It eventually took out my husband as well. The ONLY one that survived it was the baby, and I’m just contributing that to the magic powers of breastmilk! I nursed him through it all, and he managed to skate on by. If it’s not that, then he is just an extra lucky kid and I’m taking him to help me pick out lottery tickets next week! Once we were all back to normal, I had a lot of food in our fridge that needed to be cooked pronto before it all went bad. 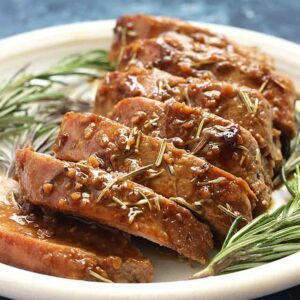 Be on the lookout for a yummy pork tenderloin recipe coming soon. ???? A big bunch of overripe bananas were staring me down and I decided it was time to make my favorite banana cake, which I’m surprised I haven’t shared on here before! 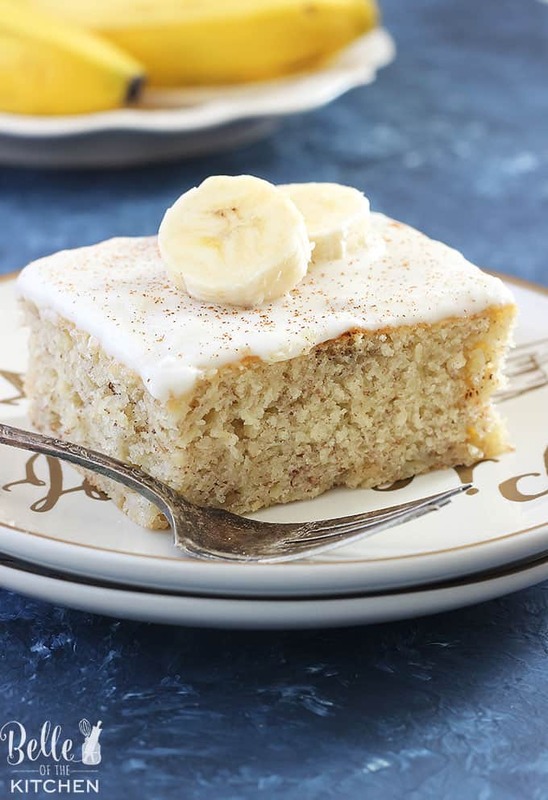 I make Butterscotch Banana Bread or Kale, Apple, and Banana Smoothies a lot with overripe bananas, but this Banana Cake is a family favorite! 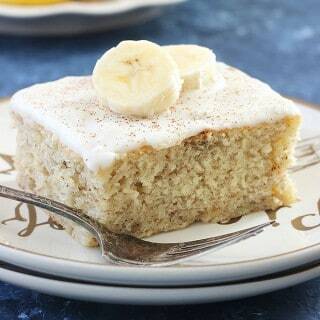 Put those overripe bananas on your counter to good use with this delicious Banana Cake! It's topped with creamy vanilla frosting and makes a perfect treat! Preheat oven to 350 degrees. Spray an 8x8 baking pan with cooking spray and set aside. Using an electric mixer, beat together the sugar, sour cream, egg, and softened butter over medium speed until combined. Add in the mashed bananas and vanilla extract. Stir in the flour, baking soda, and salt by hand, mixing until just combined. Pour into the prepared baking dish and bake in the preheated oven for 22-28 minutes, until top is golden brown and a toothpick inserted in the center comes out clean. To make the frosting, beat the butter, powdered sugar, milk, and vanilla extract with an electric mixer until smooth. Evenly spread over the cooled cake and serve. 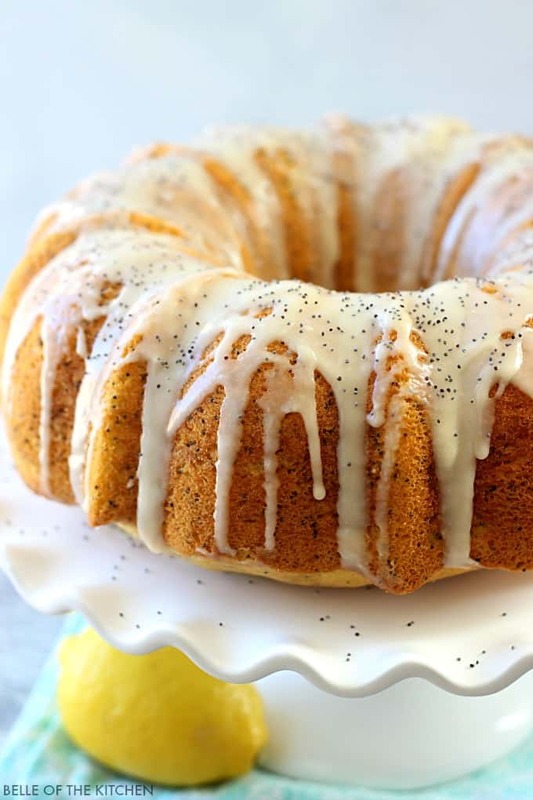 I like to sprinkle the frosted cake with a little cinnamon for an extra boost of flavor and color, but this is optional! Refrigerate any leftovers. Thank you also for the frosting recipe! I doubled it for Easter cookies and made several different colors in bowls. 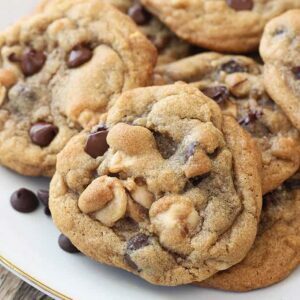 It tastes great AND has a glossy finish and crusts over just perfectly so the cookies can stack. My granddaughters had a heyday decorating today! So easy! Thanks again! Ohh! 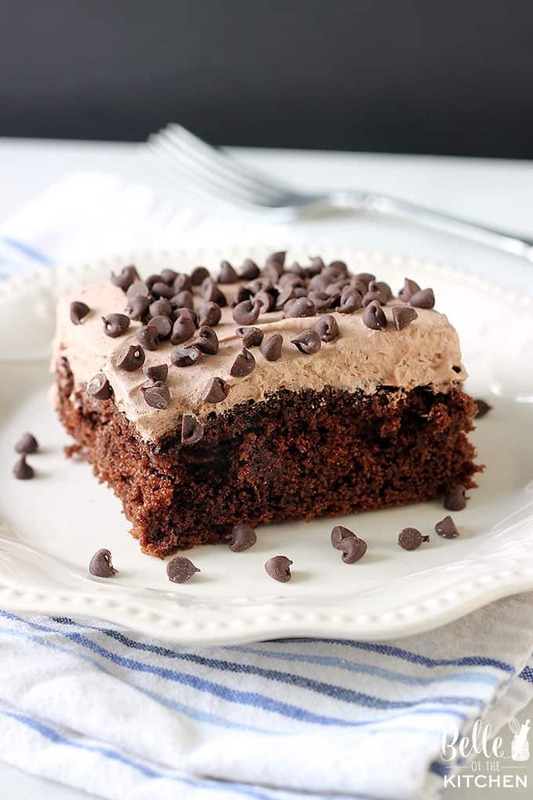 this is the yummiest ever recipe that I have tried as my kids fall in love with his delicious cake. Vanilla frosting is a lovely addition in it. I have never made a banana cake before. This one was beyond tadty!! I am very happy I tried it and will definitely make it again and again! I shared it with several people. They also raved about it! Thank you???? Yay Annie! I’m so glad everyone loved it! Thank you! LOVE THIS!!! Just made this and it is definitely a keeper recipe. Yay! So glad you enjoyed it, Janice! As my cake bakes, it smells Devine! Yummy!!! Oh goodness, thanks for catching that Niki! I will update the recipe! Glad you enjoyed it!!! I am a total banana freak and I know it is because my mom ate a ton of banana popsicles while she was pregnant with me. Sorry to hear about the stomach bug hitting your house. I hope everyone is okay now. I’ll take a few of these cakes to-go, please! I had some bananas begging for greatness!! This cake turned out so good! Thanks!!! I absolutely LOVE banana cake! This one looks divine! I loved the texture of this cake! It was moist, but not heavy at all! Thanks! Glad you enjoyed it, Michele!! I’m so glad everyone is on the mend now!! And this cake, perfectly sweet and delicious! It plates up beautiful too – what an amazing sweet treat! I have been craving something banana to make. This is going on the menu! What a beautiful cake. It looks so soft and tender! 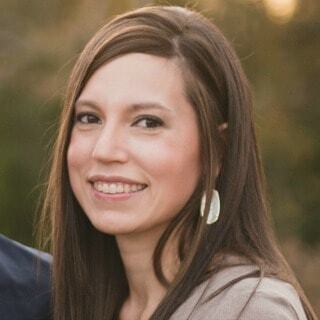 I actually have my daughter and her 3 week old baby here this weekend because her husband got the flu. Such nasty stuff. Banana vanilla is a great flavor combo! This might be the only way to use up those over ripe bananas! Looks amazing!! Would be great to bring to a potluck or get together! 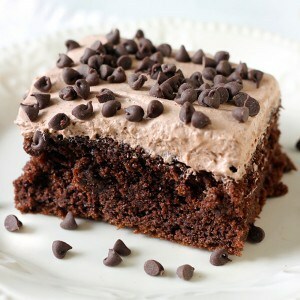 I wish I had a slice of this cake right now! 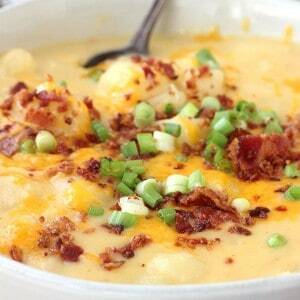 I will have to make it this weekend. My family would love this dessert! 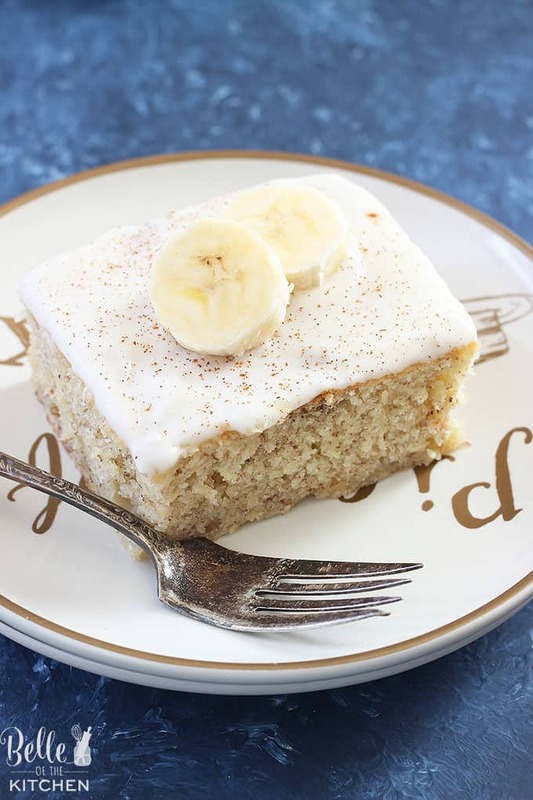 I have bananas to use up right now, and I”ve been craving cake, so this is perfect timing! I’m sorry you all got sick. 🙁 So glad to hear the when life gave you overripe bananas, you gave us this wonderful cake!! Looks fantastic!